Next month, I’ll be moving into a house owned by a “community landlord.” Rather than simply renting out rooms in the house, the homeowner (who no longer lives on the property), specifically sought out a group of people who wanted to build community there. Three of us will be the primary tenants who set the vision and values of the community, decide how to break down rent, and interview and invite new roommates to live there. Our landlord will “co-create” the direction of the house with us; provide us with transparent reports on the house budget; and set aside some of our rent money for improvement projects that we all agree upon. In today’s housing market, finding such an open-hearted renter/owner arrangement is rare. 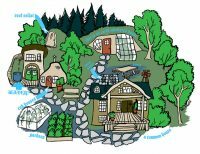 But since many intentional communities depend upon a healthy relationship with a homeowner, it’s worth looking at ways to encourage more dialogue between landlords and intentional communities. In some cases, the home may be owned by an off-site property owner, as is the case with the house I’ll be living in. Other times, the landlord may be part of the community: they may have purchased the house in order to steward it as a community asset, or they bought it with the specific intention to ask community-minded people to move into it. Each situation offers its own challenges and opportunities. Having a landlord who is also a member of the community can create tension when the community’s needs don’t align with the legal or financial burdens of being a homeowner. Is it appropriate for the homeowner to use state-sanctioned power to enforce decisions, or should they always abide by the will of the community? At a community I lived at previously, which had four owners stewarding three adjoining properties, one of the homeowners took pains to reassure us that he wasn’t exempt from community process. He felt strongly that his ownership status did not give him any special rights in the community, and that if, for some reason he was ever asked to leave, it was his responsibility to honor that request. That transparency and vulnerability gave us faith that he would use his power wisely and not abuse his role as a property owner within the community. For landlords that live outside of a community, other issues may arise. Is the landlord comfortable if the community exceeds occupancy limits in the home? Will they insist on having a role in choosing new residents, or will they allow the community to have autonomy over its membership? If they’ve lived in community themselves, chances are they may have some friends in common and be involved with intentional community networks in your city. It may not be possible to hide things from them — or you may not need to. Maybe you’ll decide that you don’t need 24-hour notice before your landlord visits, and that you’re comfortable with them visiting or attending events at your community. Co-creating community with homeowners may not be the norm, but it’s a promising sign that at least some landlords are open to the prospect. For groups that can’t afford to buy property or pursue co-ownership, it may be the only way available to them to make intentional community happen. What are your experiences interacting with landlords within or in relation to community? Have you found any strategies to foster dialogue between homeowners and tenants? ← What does it take to cooperate?